Many things have changed with the Start menu from Windows 7 to Windows 10. 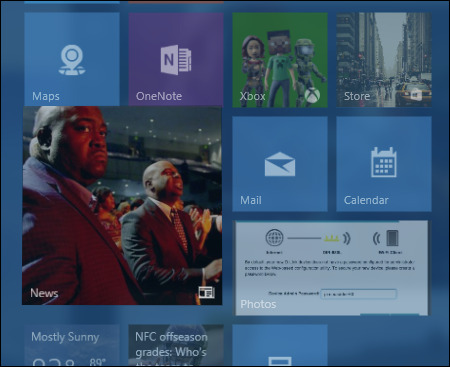 If you skipped Windows 8, you may be in for a quite an adjustment, particularly when it comes to Start menu “tiles”. We want to talk about how to add, remove, and customize them. 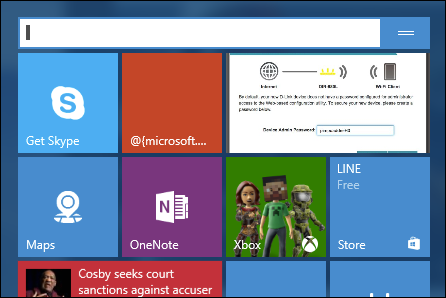 We’ve already introduced you to the basics of the new Start menu, but there’s quite a bit more to it. 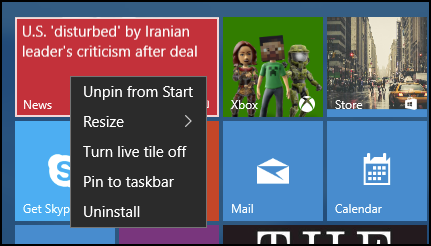 The Start menu has what are commonly referred to as tiles. Tiles can be added, removed, resized, and animated. These animated tiles are known as “live tiles” and can be used to convey useful and pertinent information, such as headlines, updates, and so on. 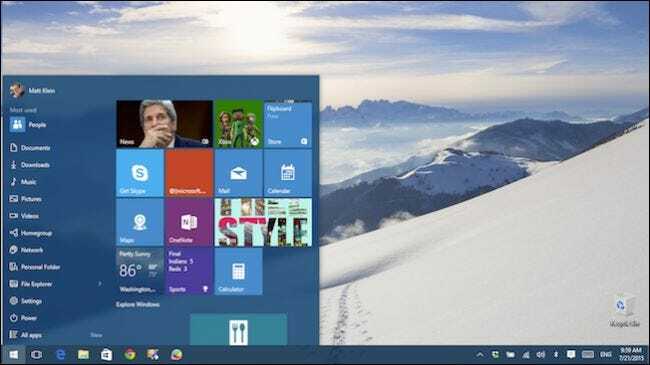 Windows 8.1 users will be no doubt be familiar with Start tiles and how to use them, but new users, that is to say users who skipped Windows 8 (upgrading from Windows 7, Vista, or even XP), may be in for a bit of an adjustment. Here you see the new Start menu. On the left are folders, settings, and shortcuts. 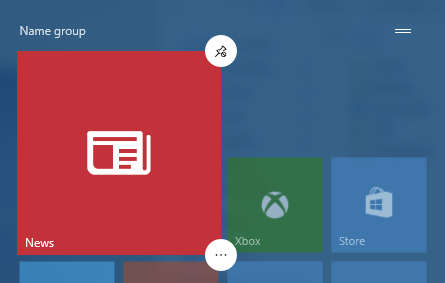 On the right, are app tiles, which usually open Windows Store apps. 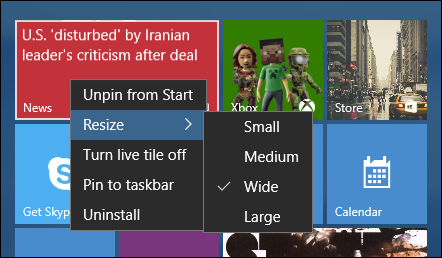 Right-click on a tile and you will see options, the first being “Unpin from Start”, which will obviously removes the tile from the Start menu. If you want to pin or repin an app then click or tap the “All apps” button, long-press or right-click the app you want, and select “Pin to Start”. 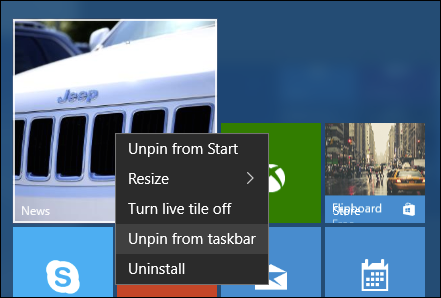 In addition to pinning to Start, you can pin or unpin from the taskbar, and uninstall the app. You can also resize tiles to better fit within your scheme. Your choices are (usually) small, medium, wide, and large. Some tiles may not have all those sizes available. Here we see the difference (from the previous screenshot) between wide and large. Live tiles might be cool to some, but to many of the rest of us they’re just a flashy animated distraction. 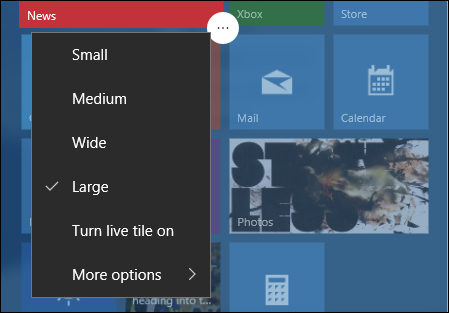 You can turn off live tiles, which will convert them to a static tile. In the following example, we see a large, static tile which has been long-pressed (such as if you’re using a touchscreen) to reveal touch controls. In the top-right corner, you can unpin the tile. 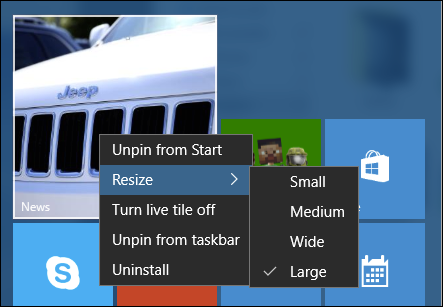 Press the button in the lower-right corner, and you’ll have access to the other options, including resize, live tile, pin/unpin from taskbar, and uninstall (available under “more options”). The ability to pin and unpin from the taskbar means you’ll be able to access favorite Windows Store apps from the taskbar, instead of having to open the Start menu every time. 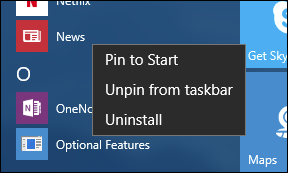 To remove it, you can either right-click on the taskbar and unpin the item, or use the “Unpin from taskbar” option detailed previously. With all that out of the way, the last thing to consider are how your icons are arranged. You can click or long-press and grab tiles to move them around and rearrange them as desired. You can also click the two lines at the top-right corner of each group to name it. So for example, if you have a lot of games installed, you can arrange them all together and then name the group “Games” or you can name your Office and other similar apps “Productivity” or something else appropriate. The new Start menu is different, but that doesn’t mean it’s terribly difficult or frustrating. For the most part, the main functions are the same as in Windows 8.1, which is to say you can resize, rearrange, and remove tiles. 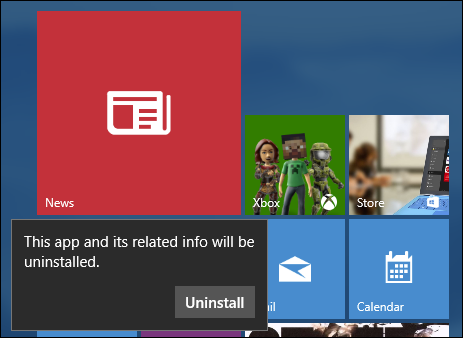 Of course, the ability to turn live tiles off is going to appeal to quite a few people who just want their Start menu to be functional and simple. If you have any questions or comments you’d like to contribute, please leave them in our discussion forum.